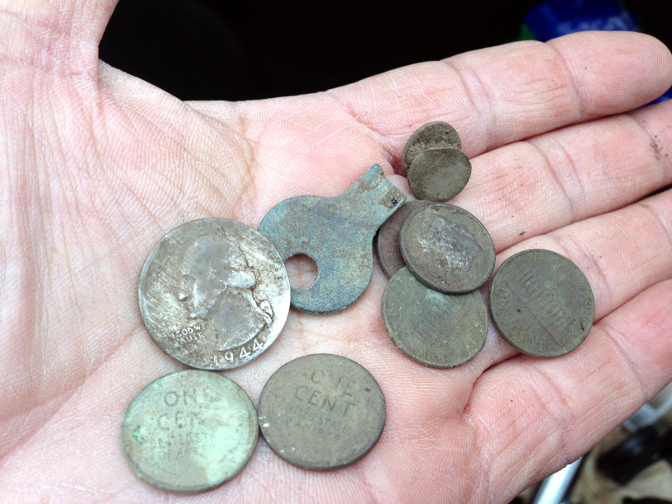 I went out this morning to Linwood park where I’ve been finding old coins for a while now. I left the Bliss home and took the Deus instead. I just wanted to hunt and not worry about the new detector. The very first signal was a nice 1904 Barber with no mint mark. Then I dug a bunch of deep trash. Last I got a crackling more than a signal. The only reason I dug it is because the all metal mode told me there was a definite object down there. The target was a 2 mil Kansas tax token. I really like my Deus. I know it. I know what it’s telling me. I just wish I could find deeper coins. 9 inches seems to be the limit for dimes. It can go deeper on larger coins of course but dimes are so much more common. At any rate, I found that dime in the same 5×5 area around this young tree where I’ve found a number of old coins before. As you can see, there is no lack of trash. All that trash with the exception of the bottle cap was deep. More rain is in the forecast so I don’t know when I’ll get another chance to detect. I am glad to have a standby park that will provide me with silver in lean times. I have spoken about this park extensively in the past and I am happy to know that other people have began to hunt it besides me. 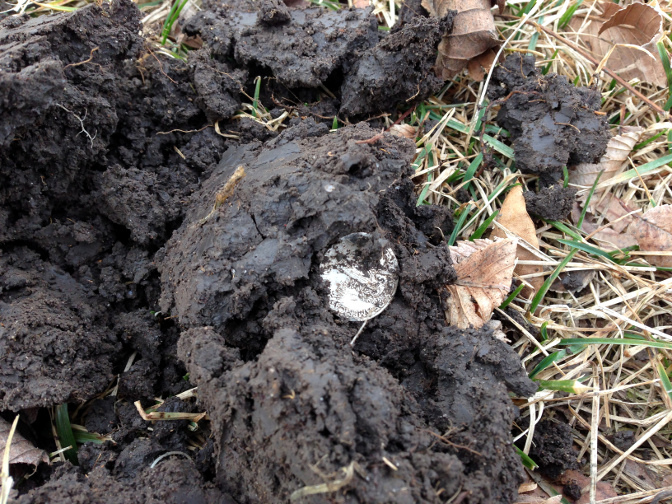 I know there are 1000’s of coins still under that dirt, alas, a little too deep for most detectors today. I plan on buying a Russian detector later this year that will hopefully get me to those coins. Anyway, I decided to hunt the ol’ standby at lunch today in spite of a light drizzle falling and getting everything wet. By the way, the XP Deus is almost water proof as the stock headphones are rain proof. If you remove the controller and put it in your pocket (or in a zip lock bag) you’re good to go in the rain. A dateless Buffalo (only the second one this year), a 1946 wheat, and a 1958 Roosevelt dime. The button is kind of cool too. It reminds me of the coat buttons of the 50’s and 60’s. So this year has been very different than last year, both in the time dedicated to the hobby and in the number of finds but I won’t complain too much as I am very blessed elsewhere. Perhaps this year will be a year of quality instead of quantity. I mean, I already found a Shield nickel, who knows what else is around the corner? The scenario was thus: a block of houses from way back then (at least one was turn of the century) was torn down. Seemingly, the school district is expanding one of the local schools. I wanted to detect these houses for at least two years. A soccer field just north of these houses has produced indians and a few very old relics. The houses sat in a area of town most people would not think to look for old houses. I mean, the school in question harkens back to the late 50’s. Then, the houses were surrounded by a wall of trees and vegetation that made it near impossible to see the houses at all. So, I went there Sunday evening as the opportunity arose for me to shake the dust off Maurice. I got there and most of the ancient trees and shrubbery had been knocked down. Still, there were some open areas to run the coil over. Two minutes into the hunt, I got a nice, shallow quarter signal and I extracted, with no small amount of joy, a 1944 Washington quarter. Nice! Feeling like I hit the mother load, I spent three more hours in the cold, yes, we got snow in freaking mid April, but all I managed after the quarter were a couple of wheats and some clad. Sigh! I hope that I get to hunt these lots once more after they clear all the tree debris and before they do whatever they are going to do there. After a long while of not detecting (due to a myriad of reasons), I was beginning to feel like maybe I had reached that point in the hobby where I didn’t care for it anymore. Incredible, I know, given the amount of time I’ve dedicated to the hobby already. My head was not in the game anymore. I went out at lunch once and couldn’t concentrate. After that time, I spent my lunch hour running errands and such. This Saturday morning however, I awoke early and no one else did. Even the dogs were asleep. I didn’t want to sit around the house so I grabbed Maurice and headed to my deep silver park. As usual, the park was quiet. I really like this park. It has a lot of character in my opinion. I decided to try something new with the Deus and so I hit the areas that have produced the most silver and which, I believed, were now empty of all good targets. Right away I began to pull targets I missed before. 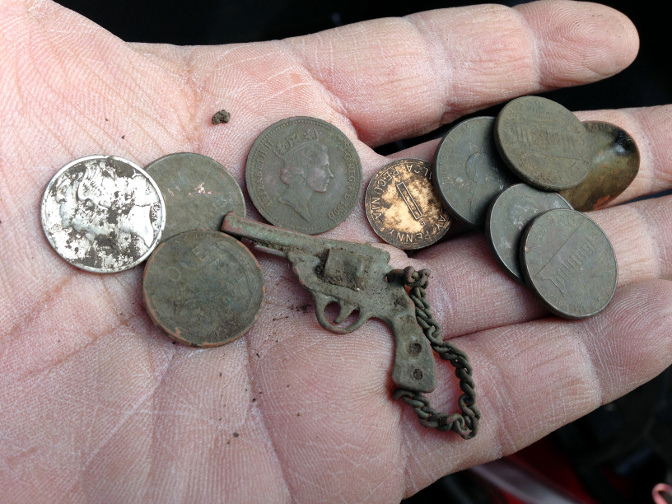 The first few things I dug up were pull tabs and bottle caps. I was surprised by these because I have tried very hard to remove all trash from these areas and I thought I had finally cleaned them up. After the trash, I began to get good targets. A 1990 Canadian penny; hmmmm… a few memorials; really??!! A couple of wheats; oh my! and finally, a 1940 Mercury dime!!! Whaaaat!!! Seriously, I have gone over these areas at least 100 times; really! Seeing that silver disk embedded in the clay brought me back to life. I am back in the fray. Here’s to many more like it! Today is a bitterly cold day. Needless to say I won’t be hunting. Yesterday, it was a different story; sunny, warm, perfect. I know I said that I was going to use my lunch hour to walk instead of hunting but yesterday I was in good spirits. Steve and I are undertaking a super-secret project and it is well on its way. It promises riches and definitely, it promises good times. So, in my excitement, I decided to hit the old trashy park. The old trashy park is very large and it has many areas I have not explored properly. I decided to go to such an area and was having a really good time cleaning up the beaver-tail pulltabs when I got a mixed trashy signal. If you don’t know by now, I dig these all day long. I dig them especially when the high tone component is somewhat sweet. I always get excited when I see a worn coin in the hole because it makes me hopeful for a Seated. Alas, no less of a cool coin but a Seated it was not. 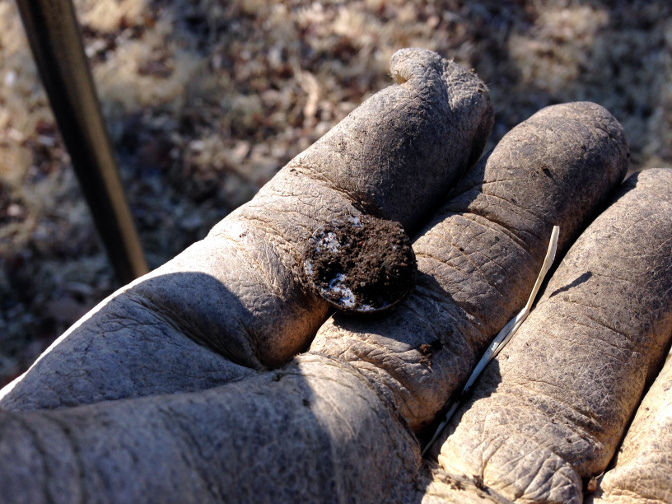 I had in my hand a well-worn 1928 Mercury dime. Silver always lifts my spirits and this day it made me even happier. Needless to say, this spot will get worked over pretty well. I won’t be posting about the super-secret project for a long while but if you see me walking down the street grinning like a fool, it won’t be because I am crazy! Friday morning after Thanksgiving promised to be a beautiful morning. I got out of bed early and decided to spend a couple of hours hunting the oldest park in the city. I got there at 7am and immediately was accosted by a couple of 8 year-old boys and their puppy boxer. They shadowed me for an hour of digging clad and deep trash. Eventually, after a vicious puppy attack on one of the boys and my subsequent rescue of such boy, they left me alone to peace and quiet. 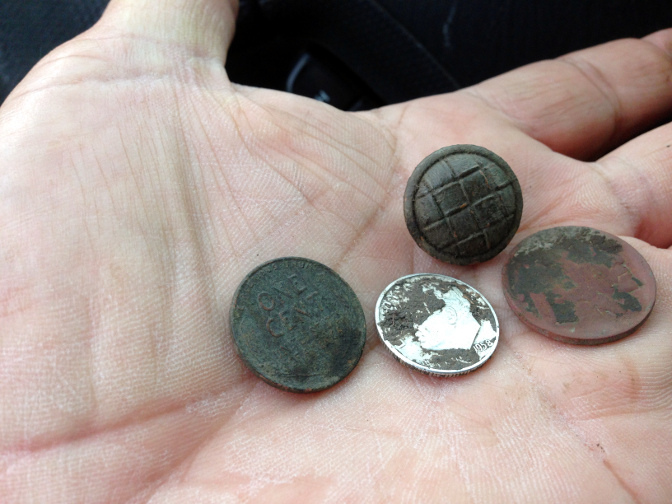 I decided to move back to the spot in the park that has produced 7 silver coins. Last time I hunted this particular spot, I dug up some cool relics but no more coins. Still, the spot is choke-full of old iron and I was hoping I had missed something. 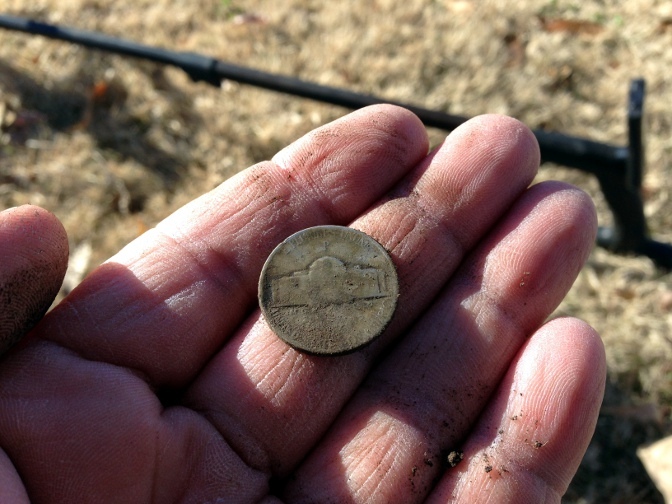 At about 4 inches of depth, I pulled this 1943P war nickel, my 8th silver coin from this relatively small spot. 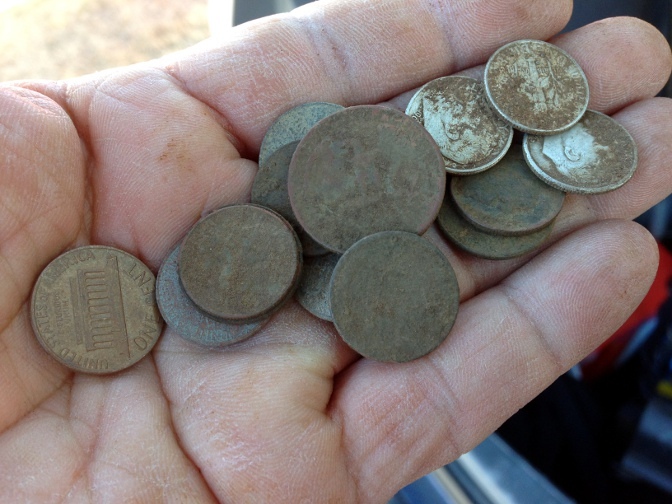 Soon after that I dug up a couple of very shallow wheats from there as well; a 1927 wheat and a 1944 wheat. I just cannot get over how many coins have come from this spot. 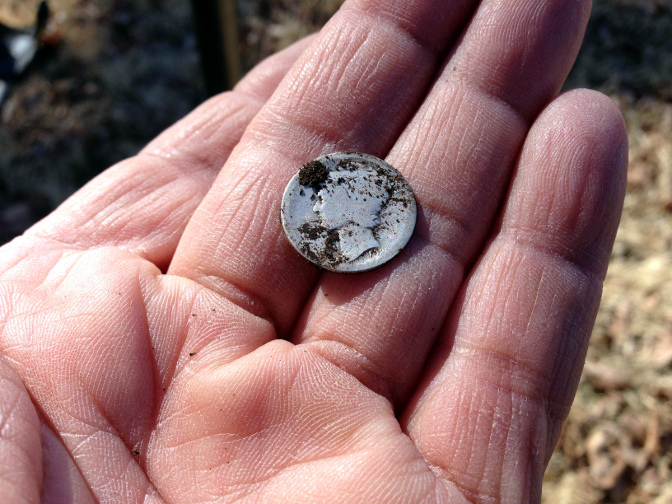 It reinforces my belief that there are thousands of silver coins left at our city parks, all masked by iron or trash. By the way, the boys returned to the park, this time tagging along their 2 year old brother who began imitating me by stomping the dirt on the holes I dug and, sometimes stomping on the holes even as I was digging them! LOL! He was very funny in that he got very excited every time I dug up a worm from the ground. I asked one of the boys where they lived and he pointed to a Victorian era house across the street. Next to this house, there is a another equally old house that has been abandoned for a few years now but which we cannot hunt due to the fact that the father of the boys always calls the police on anyone attempting to detect it. I don’t think I go to far in thinking that I may have a way to gain permission to hunt that house. We’ll see. After we had eaten our fill and everyone gathered in groups to gossip, er… I mean to catch up on family stuff, I silently exited the building, grabbed Maurice from the car, and headed across the street to a row of houses that looked to be empty. I wasn’t planning on hunting the yards since they were tiny and overgrown; no, I had the grass strip in my cross hairs. Interestingly, the original sidewalk from the mid to late 1800’s was still there but buried under 8 to 9 inches of dirt! I knew that the coins I really wanted were now beyond my reach but there were still plenty of targets in the soil covering the sidewalk. It sure felt good to hit silver again. I think I may arrange to hunt this town again. I know there is a hunter here who is kinda legendary but obviously he hasn’t cleaned out every spot.